All Products > "2212058 HiTec HS53 Feather Servo 8g (Unboxed)"
The HS-53 is an economical, feather servo designed to compete head to head with the influx of low cost servos while still maintaining Hitec's renowned quality. 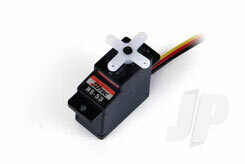 Designed with a durable nylon gear train and an efficient three-pole cored motor, this light-weight servo is a terrific fit for small power planes and gliders. Priced right, it is sure to become a universal favourite!